In the afternoon my kids have always had quiet time. With our new baby's arrival I've been trying to spend extra time in the afternoon with my 3-year-old while the baby naps. All too often I give into his demands for screen time and we both veg on the couch out of exhaustion. Somedays I actually manage to pull together something for us to do. 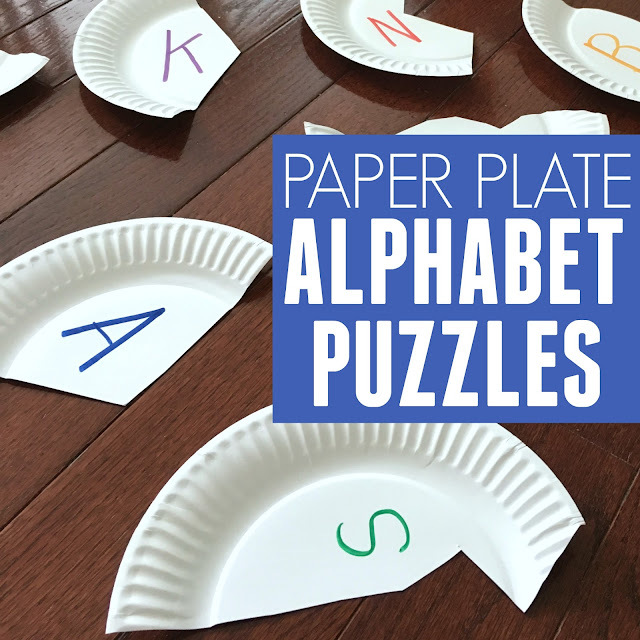 Last week I had the genius idea to make paper plate alphabet puzzles. My son thought they were AMAZING. Scroll down for my quick tutorial on how to make the abc puzzles. We love alphabet activities. We especially love active alphabet activities that get kids moving and learning at the same time. There is something awesome that happens when your body is moving... while your brain is learning. The connections just seem to happen better and things just click. This activity took make only a minute or two to pull together and it lasted awhile! To get started you want to cut paper plates in half. We tried to cut each plate a bit differently. After we cut one plate then we wrote a lowercase letter on one half and the corresponding uppercase letter on the other half. For this activity we used the alphabet letters in my son's first and last name because those are letters that we talk about all the time and are important to him! Once we created the puzzles we shuffled them around and then we started matching the pieces together to complete the puzzles! While we played we talked about the alphabet letters and sounds. We also talked about what the lowercase and uppercase letters looked like while we put them together. My son noticed some similarities and differences. Once we played one round then we mixed the puzzle pieces up and played again! This activity is fun for an individual child to do and you could also do it with a larger group. We enjoyed working together to beat the time. Kids sometimes get frustrated if puzzles don't go together exactly. You can always use some tape to make sure that the puzzles are securely stuck together. 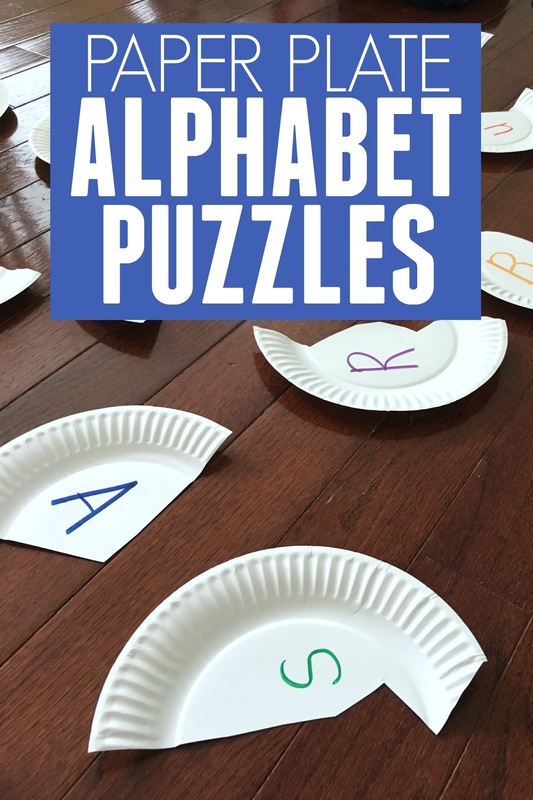 If you have kiddos that like alphabet activities, this is a great easy one to start with. You can find some of our other favorite alphabet activities in our Active Alphabet post. We also have an Alphabet Activities Pinterest board that has fun ideas on it!